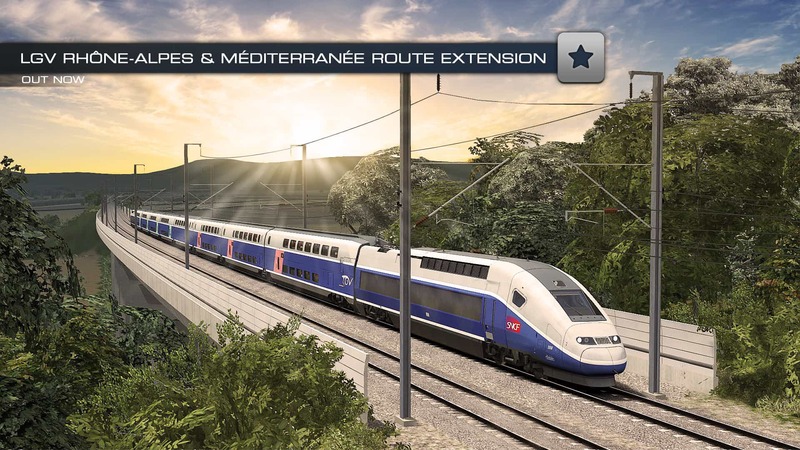 Head for the sunny south of France once again with the LGV Rhône-Alpes & Méditerranée route extension, which is available now for Train Simulator. Very interesting. I wasn't expecting this so soon after DTG's other releases, but it makes a welcome addition to the French railway network. It might have been more interesting if other types of TGV unit were released with this add-on. Instead it's just a repaint of the Default unit. I'm loving this new extension. I've always liked TGVs so it's great to have this route in Train Sim! One thing I've noticed though, is the physics/acceleration of the TGV seems way off since the update. It seems like something's up with the Tractive Effort curve. I took a look at the TractiveEffortVsSpeed file in the add-on and noticed the values match up with the graph of the real train, except the graph is for the entire trainset (two combined locomotives) rather than one, so essentially in-game each power car has the force of two power cars. I halved the Y values in the TractiveEffortVsSpeed file and found that it now performs much more realistically. It now takes over 5 minutes to reach 300kph which is much closer to the real thing, rather than as before where it can get to 300 in around 2 minutes up a steep gradient. Apart from that issue I really love driving it, and really looking forward to the Reseau! Would it be possible for this to be looked at for a future update? I really think that the circuit breaker simulations should’ve been added for the Duplex since it’s very important to open the circuit to switch pantographs and to cross neutral sections. 192 miles worth of zooms! Literally! You go to the Free Camera or Trackside Camera, ZOOM!!! I've booked this in to our system for you. Really a fantastic extension to the Avignon-Marseille route, a must-have! Being able to drive for such an extended time at 300 km/h is great! Some of the schedules even in the "easy" career routes are very tight (2 to 4 mn shorter than real SNCF timetables, ie no regularity margin), using the VI (cruise control) is recommended to be on time, and not always enough. I have noticed a weird behaviour with the brakes (Hold->Apply->Hold: at the second Hold, pressure in the brake cylinders continues to go up, so you have to Release if you don't want a penalty for breaking too hard. It makes smooth stops more difficult and doesn't seem to mimic the PBL brake correctly. The KVB seems to light up the orange light (LSSF) at unexpected places in Lyon with no corresponding warning signal -- for example between Lyon Part Dieu and the LGV, when passing one of the 2 other stations --, but maybe it's my mistake. Still investigating. A great route nonetheless! Recommended. PS: it would be nice to have a functional real time clock in the cabin. It's the LCD display on the left hand side, just over the wiper button. It shows HH:MM:SS as far as I know.